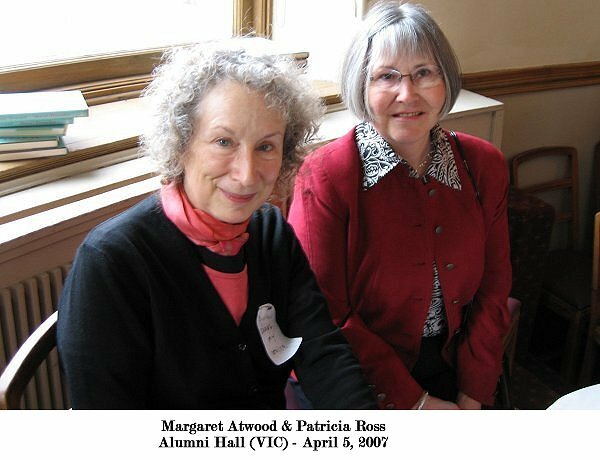 Margaret Eleanor Atwood was born in Ottawa, Ontario, Canada, on 18 November 1939 to parents Margaret Dorothy Killam and Carl Edmund Atwood. She began writing plays and poems at the age of six. Since then her works have been both legion and legendary. She is a noted humanist, inventor, feminist, literary critic, environmentalist and political activist . . . always on her own terms. Her The Penelopiad, a contemporary feminist twist on Homer's The Odyssey was first presented as a joint production of the Royal Shakespeare Company and the National Arts Centre in 2007, and with an all-female cast for the 33rd season of Nightwood Theatre in 2012 as women played all of the male roles. Toronto's Nightwood Theatre is the oldest professional women's theatre company in Canada. During the first presentation of The Penelopiad in April of 2007, Margaret (VIC 6T1) was a guest at the Victoria College Chancellor's Council meeting. The following photo was taken in Alumni Hall of Margaret and my wife, Patricia, on that occasion. 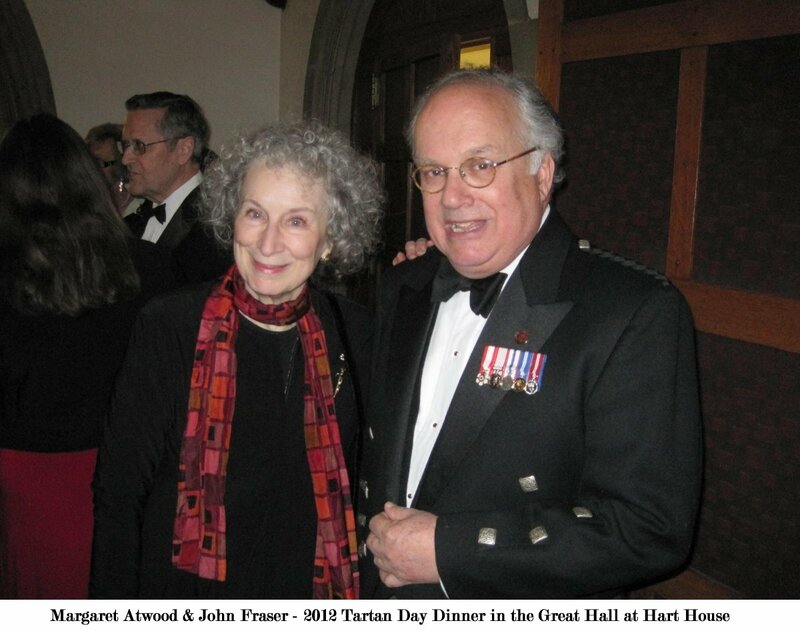 Margaret was a guest at the Tartan Day celebration of journalist John Fraser's acceptance of the Scot-of-the-Year award in 2012. They shared similar qualities. Fraser was recognized as an author, critic (music, theatre and dance), broadcaster, monarchist and political activist (e.g. the Beijing Spring of 1978). At the event sponsored by the Scottish Studies Society in the Great Hall at Hart House in 2012, I took the following photograph. Atwood has taught at several universities and received several honorary degrees. She was made a companion of the Order of Canada in 1981 and received the Governor General's Award twice (1966 and 1985). She became the winner of the Arthur C. Clarke Award in 1987, the Booker Prize in 2000, the Prince of Asturias Award for Literature in 2008, and many others. In 2001, she was inducted into Canada's Walk of Fame. Margaret was presented a Queen Elizabeth Diamond Jubilee Medal in 2012. The Globe and Mail newspaper of October 2, 2015, just prior to the national election, noted that Margaret considered Canadian Prime Minister Stephen Harper a dictator in the making, who has convinced some people that they would be financially better off under his leadership . . . adding that this is untrue. She stated,"We know that Santa Claus is really our parents, but we don't want to look at that too closely. People do that all the time. We know that Stephen Harper is a dictator in the making, but he's convinced people that they're going to be financially better off under him, which is untrue." When University of Toronto President Claude Bissell said, "Dissent", during the mid-fifties, we rebels and activists at Vic muttered, "Yes, Sir!" Thank God there was enough of that spirit left over for the 6T1 crowd. Thank you, Margaret, for attending the Scot-of-the-Year Award to John Fraser on April 12, 2012. We're sorry that we'll miss you on May 13, 2016, when the Scottish Studies Society honours Alice Munro at the Arts and Letters Club in Toronto; I was told that you'll be out of town. 1. Interview of Alice Munro by Margaret Atwood in 2014. 2. Margaret's ideas on Why We Tell Stories. 3. Nobel Literature Prize Interview of Alice Munro in 2013.